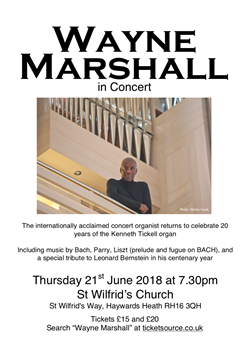 In 1998, Wayne Marshall, the prodigiously gifted international concert organist gave the inaugural recital on the brand new Kenneth Tickell organ. He then came back 10 years later, and we are delighted to say that Wayne will make a third visit on Thursday 21st June to celebrate our organ’s 20th birthday. Wayne studied at Chetham’s School of Music and the Royal College of Music before commencing a stellar career as piano and organ recitalist, conductor and composer. He is in huge demand all over the world and this year he is playing at the Royal Albert and Bridgewater halls. For Wayne to come to St Wilfrid’s is a rare opportunity indeed, and is a testament to his fondness for our people and the very special instrument Kennet Tickell built for us two decades ago. The Kenneth Tickell “opus 38” is a 2 manual and pedal organ and has 20 speaking stops. Despite its fairly modest specification, it has a wonderful palette of colours and fills the church very effectively from its purpose-built west gallery, and is at home in a wide variety of music from Bach to Messiaen. The organ’s tone is complemented by its beautiful case in American oak.